Click on “Add Survey” in you dashboard and fill in its name and the description. Choose the design template, language and other required properties. Everything can be changed later in the Settings section. You can see the questionnaire page. Click on “Add Question”. Select question type, question text, answers and click the Save button. There are many options you can change to customize the logic and behavior of the question. See the chapter Questions for more details. You can also fully change the look and feel of the question on the “Preview and Design” tab – just click on the requested item and change its style. 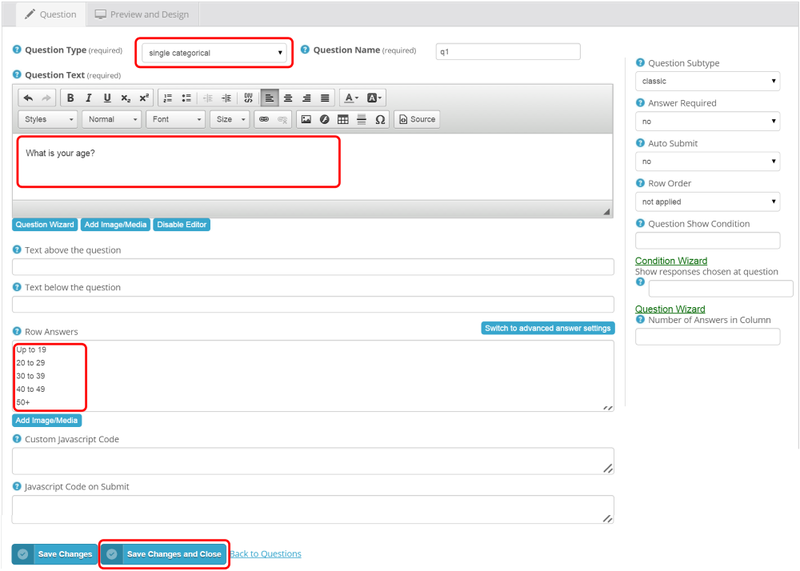 You can also also move questions, split or merge pages, randomize or rotate the questions, add images and many more. The system is very flexible and you can create a completely new type of question or change the current ones. You can have several sources of your respondents for each questionnaire and combine them. We call it a channel and it means one specific source of respondents. It is up to you whether you use one channel or many channels. There are three types of channels with different pursposes. Use the “Public Link” for surveys that are accessible for everyone who knows the questionnaire address. Choose “My Sample” to import your own list of respondents (emails) or restrict the access to limited group of respondents. The third type is “External sample” which automates the connection between OpenSurvey and external panels. Each channel has its unique URL address. See the chapter Respondents for more details. Go to the Collect section and click on the testing link. Check the questionnaire and go to Questions to change anything if necessary. Publish the survey to make it available for respondents. This can be done in the Collect section. After publishing, your survey is live now, respondents can enter the questionnaire and complete it. You can publish the link on your web, Facebook, Twitter, send the survey invitations per email, mail or any other way. You can check the survey status at every moment. See the results real-time or download data in the Result section.